In a large jug or pitcher, combine sugar, lemon juice, and fruit. Stir to combine. Add rosemary spring and let this sit for 30 mins to release flavour. Add gin and wine and stir lightly to combine. Cover and refrigerate overnight, or if you are pressed for time, you can leave in fridge for a minimum of 2 hours. Serve garnished with a mini sprig of rosemary if desired. 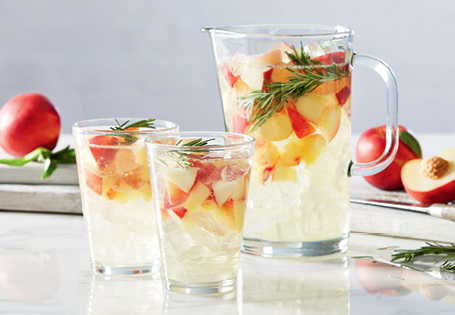 *You can also use white or yellow peaches in this Sangria. Vintages may vary from store to store. Every effort is made to ensure the current vintage is displayed, however variations can occur. Liquor is available in selected ALDI stores in NSW, VIC, ACT and WA. Due to liquor licensing limitations, liquor is not sold in any QLD or SA ALDI stores.